If ever there was an enigma look no further than Scald. The band released their one and only album, on cassette, in ’97. It was hailed as a masterpiece by those few lucky enough to hear it. Their reputation then spread like wildfire through tape trading circles. But as rapidly as they appeared the band vanished again after the sudden and mysterious death of their singer. Agyl. The Russian wastelands remained eerily silent until late last year when it came to my attention that a Russian mailorder, Blacksmith Productions, was carrying a re-pressed CD version of the cult album. Some months later, Scald’s bassist, Velingor, chanced upon me. Not one to let omens pass me by it was high time to delve into the murky history of, perhaps, the most obscure band in Doom. Welcome Velingor, to the realm of the Pariah Child! How is life treating you in your native land this fair spring? Greetings to you, to Great Britain and proud Ireland! In our northern woods the spring comes slowly. Sometimes it is snowing and cold winds blow. But gradually, the chill recedes and shrouds our ancient land in more and more warmth! This meeting is, indeed, good fortune. Many of my friends are awed by the legend of Scald. One, I think, which deserves to be kept alive. Does it seem strange to be asked to give an interview about a demo you made eight years ago? The truth is that the musical material recorded in ‘96 “Will Of The Gods Is Great Power” reflected an album. In our land, overlooked by a civilization during those years, it was very difficult to make a good record. It cost us dearly. Furthermore, it was the first experience of the sound engineer in the studio to deal with music such as SCALD. Therefore the production of the material is far from perfect. ” Will Of The Gods Is Great Power “ was realised by Russian label, Metal Agen, in ‘97 on cassette and this was already after Agyl’s death. Then in ‘03 our old friend, Anton St. Ruck, from label, Wroth Emitter, re-released this album on CD with a new cover and bonus track. Well, as so little is known of the band bar what is written on the sleeve accompanying the album let us begin at the beginning. Please tell us when, how and why the band was formed. It was in ‘93. Our guitarist Harald and I played Doom in band ANAMNESIS VITAE in the tradition of CANDLEMASS. Agyl and our drummer Ottar played in band ROSS where they tried to execute epic Metal music in traditions of MANOWAR and BATHORY. But other musicians in these bands did not understand this style and did not want to play such music. Some of them wanted to play Thrash Metal and others wanted to play easy listening Christian Rock. Agyl and Ottar, Harald and I were already familiar with each other for a long time. Then in the autumn ‘93 we met drinking beer and discussed our general problems and desires. Here we decided to unite our forces and SCALD was born. Russia is a vast land. Where exactly are you from? Is that where the band was based? And was it difficult to find like-minded individuals and capable musicians to realise your vision? We are from Yaroslavl city, which is near Moscow, possibly 360 kilometers away. Our city is on coast of the great Russian river, the Volga. Our city is very ancient, almost 1000 years old and it is impregnated with the most ancient Slavonic history. 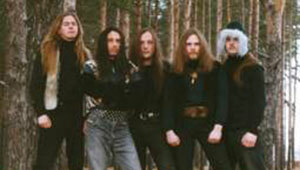 In the early years, the music of SCALD was practically not perceived at all by Russian Metal fans. They only wanted to listen to Thrash or Death Metal. If somebody was interested in Doom it was MY DYING BRIDE, TIAMAT and PARADISE LOST. SCALD did not relate to their criteria. Most peaople counted our music boring and uninteresting. But in the middle of the ’90s our situation gradually changed for the better. SCALD began to be appreciated on the Russian Metal scene and was invited to play at Metal festivals. Scald is quite unlike any other bands. What are your roots and influences? For those who have never heard your music how would you describe it to them? SCALD has been influenced by BATHORY, especially the “ASATRU” period, which includes “Hammerheart”, “Twilight Of The Gods” and possibly even a little by “Blood Fire Death.” But also MANOWAR albums, such as “Into Glory Ride”, “Hail To England” and “Sign Of The Hammer” played their part. These are the greatest examples of powerful epic Metal!!!! And as we have tasted influences from CANDLEMASS, SOLITUDE AETURNUS and SOLSTICE (UK) this helped to define the style, ANCIENT DOOM METAL. We then did not know about the term, VIKING METAL. “Will Of The Gods Is Great Power” is the only recording Scald released. How much time was spent writing and refining those songs before the recording known to us took place? Please describe the song writing and rehearsal approach employed by the band. Each of songs from this album was composed over a very long time. We touched a set of various reeves and their combinations. Agyl’s vocal parts were continually improved and completed. At that time, it seemed to us like a natural process. “Night Sky” was the first song that we composed in SCALD in ’94. Agyl and yourself collaborated on the lyrics. Did you pen each song together or are you responsible for separate songs? If so, please detail them accordingly. Everyone gave their ideas for songs to Agyl. Sometimes we composed lyrics together while drinking beer. But the inspiration behind the lyrics always came from him. The essence of them was always rooted in ancient Scandinavia even though we never travelled there. He also transferred his feelings into the lyrics. The only song, where the lyrics were completely composed by me, is “ETERNAL STONE”. Which lyrics make you most proud and why? I think it is “Night Sky” because in this song are reflected most REAL feelings of a person seeing morning stars. Please elaborate on the underlying themes of “In The Open Sea” and “Eternal Stone” or any other songs of your choice befitting greater attention. “In The Open Sea” is a song about infinite travel through the sea, which bears in it death. Thus it continues to draw to itself the secret and opening. “Eternal Stone” is a song about the single ancient stone, which has any worth on an island. Magic runes are traced on this stone, which threaten by magic forces those who attempt to sail by the island. Thereby, the stone protects the island from unwelcome visitors. The songs of latter period SCALD, such as ” Sepulchral Bonfire ” and “A Tumulus”, are centred on elements of ancient Slavonic legends. How important are the Viking myths and heritage to you? It seems that the interest is more than academic. Do you live by their old codes or perform rituals in praise of the gods? At that time, Scandinavian mythology very much interested us. We often read many books on this subject and took inspiration from them. Certainly, we never made any ceremonies and rites. But all this was inside us, in our hearts. We lived in fjords, by the cold northern sea and lived campaigns of vikings. We lived gloomy pagan rites of ancient Scandinavians, by winter silent tundra where Odin watches over his ravens and boundless dark woods…all of us really embodied it as though we merged with this world. Is there a strong Viking culture in your part of Russia? Or would it be frowned upon by the established order? It is very difficult to speak about it now. In days of Great Novgorod and until the Christening of Russia our culture has been very closely connected to the culture of Scandinavians. They named our people “Varyags”. Many “Yarls” from Sweden and Norway served Russian princes in fighting teams and some of them even became princes (in Russia it called “Knyaz”). Therefore our cultures are very much inter-connected. If our pagan cultures are compared there are some broad similarities. For example, a cult based on our Thunder God, Perun resembles that of the Scandinavian one, Thor. Do you find value in the teachings of Christianity? If we speak honestly, we have never been religious people. We never liked religion. Our feelings towards Christianity are especially strong and never friendly. But we cannot be enemies of Christianity, as it simply does not interest us. Returning to the original cassette, how many copies of it were made? Were they primarily for the attention of labels and the media? What were the initial reactions to it? 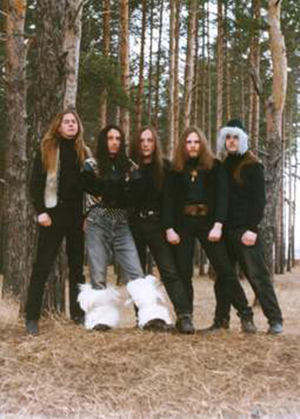 Up to the album, ” Will Of The Gods Is Great Power ” SCALD recorded two demos: ” North Winds ” ’94 and another variation of “North Winds” ‘95 with a studio version of song ” Sepulchral Bonfire “. The latter demo was realised on cassette by undergruond Russian label, Gothic Horde. Both demos were actively distributed both in Russian and foreign fanzines. In the beginning of ’97 the Finnish label, Spinefarm Records, expressed a desire to realise ” Will Of The Gods Is Great Power” but later refused to do it. The result, ” Will Of The Gods Is Great Power ” was been realised by autumn ’97 on cassette by Metal Agen by which time SCALD did not exist any more as Agyl had died. Was critical acclaim important to you or do you simply prefer to share the music with those who have ears to appreciate it? We always wanted to play melodious, epic music with an “ancient” feel and sound. We were indifferent to whom and what people thought of us. Did Scald receive any correspondence from western bands, distros and fans during the mid to late ‘90s? Have you any familiarity with then contemporary bands from Ireland such as Thy Sinister Bloom, Graveyard Dirt, Arcane Sun or Mourning Beloveth? Yes, at the end of the ‘90s when SCALD did not exist any more, we received positive publications and reviews in the many varied musical magazines both in Russia and later in many other countries. The response was greater than during the existence of SCALD. It is possible even to say that SCALD received fully posthumous glory! Unfortunately, we did not share any contacts with bands from Ireland. Of all the bands that you have listed, I have only listened to MOURNING BELOVETH. This is not that surprising as it is the only one that still plays. Anyway, did you play any gigs or tours to promote the album? What bands did you play with? Did you know or ever meet Gods Tower from Belarus? What was your most memorable live experience? SCALD played concerts in our city, in those cities nearby and in Moscow. We did not travel far. Distant trips have begun with our current band, TUMULUS. We have sometimes made foreign tours. But as SCALD, at various times we played together with such bands as MENTAL HOME, STONEHENGE (two musicians from this band play now in Russian Black Death Metal cult ROSSOMAHAAR), SAINT’S EVERLASTING REST, GREAT SORROW, ORTHANG and many others. Unfortunately, many of these bands have already split up. In my opinion, we played the most unforgettable concert together with the Russian Power Metal legends, ARIA. It occurred in a stadium before 1000 fans! Regarding GODS TOWER, certainly I know this magnificent band. But unfortunately, SCALD never played with them and we are wholly unfamiliar with any of the musicians from this band. Unfortunately, this great band split up a long time ago and at the end of the last year the main composer and guitarist of this band, Alexandr Urakoff, died. I am very sorry to hear this sad news. May his soul rest in peace. Perhaps now we will never hear the full story behind this mighty band. If anybody can share a contact for Gods Tower it would be much appreciated…Moving on, Velingor, how is Heavy Metal generally viewed in Russia? Have these views changed over the years? I think that now Metal is not so popular in Russia compared to 10-15 years ago. Certainly, Russian Metal bands now play on qualitative instruments and have an opportunity to do good records. But almost everyone continues to play “secondary” material. The predominantly copy foreign Metal bands. For this reason, they tend to have small value in the Metal world and are popular basically in Russia and the CIS. The most widespread Metal styles now in Russia are melodic Death, Black and Power Metal. I think that 10 years ago in Russia and the CIS there was much more interesting and original bands. For example, BROKEN SOUL, CANONIS and CROWNEAR. Their art was much more sincere though more often they had demo tapes with bad quality. And GODS TOWER put in pawn a basis of the original sound at that time! Did the band have ready access to equipment, studios and venues? Who is Mr Nekrasov? And why did he go to such lengths to hinder not only your progress but also that of other bands? During those years in our city it was very difficult. Concerts were seldom arranged, perhaps one or two a year. It was very difficult to agree upon the participation of SCALD in them. Good instruments were then very expensive and we were frequently compelled to borrow good instruments from our friends. Mr. Nekrasov was engaged, at that time, in the organization of concerts and owned the concert equipment. He constantly deceived bands and did not pay them money from concerts. He even arranged sabotage: “Pay me right now or the concert will hot happen” (though conditions were stipulated always before hand). Actually, he has deceived many musical people in Yaroslavl, in fact, almost all of them! Fortunately, he has now got many enemies and is no loner engaged now in the business. He now has a very bad reputation. How did you view the prospects of the band one year on from the recording and release of the album? What plans did you have at that time for the future? We had many plans. In ‘96 and ’97, SCALD already had a very good reputation. There were many invitations to gigs and festivals, even from other countries. There were plans to record a new album, as the new material was almost ready. But all stopped with Agyl’s death. He was the leader of band, the main composer and the ideologist. He was a very powerful vocalist who sang with genuine emotion. At concerts he fell into a trance! With the loss of such leader and the vocalist all of us agreed that SCALD would be no more. SCALD=AGYL and AGYL=SCALD. It is an axiom. The band suffered a crushing blow on 6th September ’97 with the tragic death of Agyl. He was not yet 25 years old. What was the cause of his death? How did it make you feel? Until now, this sad history has left many obscure episodes. Agyl was found dead with a broken skull near railway tracks, most likely, due to going under a train. Approximately one year prior to his death his family problems begun He experienced much hardship because of it. But he never stopped being involved in music. He was constantly improving his vocal and spoken parts in new SCALD songs. He was a very emotional person, and it is possible on that rainy day he was in deep depression and did not notice what was happening around him. Personally, the judgement that Agyl is present no more has only come through time. I could not comprehend that the person who was my friend and with whom we played in SCALD is gone. Agyl’s death halted the band in its tracks. Was this a conscious decision on your part? Did you try to recruit a replacement singer? This decision was completely realised. We well understood that we would never find a vocalist like Agyl. Agyl was more than a good vocalist. He got used to the images about which he sang. That is huge rarity. We all then decided that we should do another band with new music. Thus appeared TUMULUS. The name is a symbol of memory about Agyl and we began to experiment with Slavonic Folk music with a Metal sound. Perhaps TUMULUS is not a huge departure…can you share some insights into that period of your lives? The early period of TUMULUS was very hard for us. It has really taken on a life of its own and this new band begins a fresh page of Russian Metal history. How did the respective band members spend their lives in the years that followed? Did any of you continue to pursue a musical career? Did you keep in touch with each other? All of us continued to play together in the early period of TUMULUS. But gradually, the musicians playing in SCALD have left TUMULUS for the different reasons. One of them did not want to continue to playing without Agyl, others have left TUMULUS because of personal disagreements with others musicians. Two years on, drummer Ottar, has returned. Guitarists Harald and Karry do not want to play more in a band although they sometimes play their guitars. I sometimes telephone Harald who now lives in the other city. But I have not seen Karry for a long time. Wroth Emitter re-mastered your album in spring ’01 although did not re-release it until ’03. How did the partnership come about? Why did it take essentially two years to realise? The timely re-release seems to have been much welcomed. Can you say how well it is selling? How important was it to make “Will Of The Gods Is Great Power” available again only this time on CD? Do you expect to reach more people who missed the album first time round? The cassette variation realised by Metal Agen in ‘97 sold out several years ago and cannot be found anywhere. The re-release on CD was long overdue!!!! There is huge interest from Japan to USA!!!! We did not expect such huge interest especially as SCALD split up a long time ago!!!! Would you care to elaborate on the design and symbols contained within artwork? The whole presentation compliments the flavour of the music and lyrics. Yes, Anton from Wroth Emitter is a big fan of SCALD. He reads literature about ancient Scandinavia and lived in Norway, Sweden and Finland for 3 years. It has been very carefully designed with new artwork for this re-release. An earlier version of “Sepulchral Bonfire” was included as a bonus song. Do you have any other earlier versions or previously unreleased songs in the vaults? This version was recorded in studio in ‘95 and included on the second variation of the “North Winds” demo. This version is a good bonus to the basic material found on “Will Of The Gods Is Great Power”. There are old versions of some songs, which were recorded in different years during SCALD practises. But the quality of them is very bad. I think it best they should not be released officially. In the age of reformations, has Scald considered joining the popular movement? Or is this pressing simply homage to your deceased friend? If anything, what happens next? It is difficult to tell. But many people are learning about SCALD and want to receive the CD. Only when they read the information on the booklet do they learn that the vocalist of this band was lost a long time ago. Therefore, I think people are really interested by SCALD music. I hope that this will go farther!!! Do you still listen to Heavy Metal, Doom or Folk music? What bands and albums receive regular rotation on your stereo? Yes, we continue to listen to the music that inspired us in the days of SCALD. For me, even now BATHORY “Hammerheart” remains an unsurpassed masterpiece!!!! But now I listen a lot of Russian National Folk music and Russian Folk Rock. It inspires me a lot!!! But I listen to a lot of different Metal except Nu Metal and Industrial, which I perceive, is not for me. You are a wise man! Finally Velingor, you must make some life choices: Spring, summer, autumn, or winter? The oral or literary tradition? Mead. I don’t like vodka or mead with beer! Burial at sea or the funeral pyre? A line or a circle? If you could ask me a question what would it be? I very much want to play in Ireland with my band TUMULUS!!!! How can I make it happen? It is very difficult for the citizens of Russia. As your band is almost unknown in Ireland I suggest sending me a recording of your current material, which I can circulate to the appropriate people in the music scene and to potential fans. While your name spreads we can look at the best and most affordable way for TUMULUS to travel here. If you are really keen it should not be too difficult to book some venues, invite local bands to play in support slots and also ask them to provide you with the necessary equipment. The same people should be able to provide you with hospitality such as beer, food and a place to stay. Let me know if you want to pursue it further and I will help as much as I can. Now our paths must part. Thank you, Velingor, for sharing your memories with us. May Lady Luck look upon you favourably. Close this chapter as you see fit. Many thanks for that. Listen to and remember SCALD in your country. I think that Agyl has been accepted into Valhalla as the great singer he is, charming the gods with his voice. I think that he sends all of you the gratitude for this memory!! !